Did You Receive Free American AAdvantage Platinum Status? I received a free offer for American AAdvantage Platinum status. I hate writing about targeted offers, because (a) I never get them, and (b) they are usually useless for general public. Except when I do get targeted offers myself, because then it tells me one thing: if a targeted offer — any kind of offer — has found its way to my mail box, it’s widely targeted. Because, once again, I get them almost never. So check your emails including promotion and spam folders if you haven’t done so already. My first reaction was Wait, what? Me? Why me? What did I do? I mean what did I do to deserve it? The answer is nothing. And by that, I mean absolutely nothing! It’s been years since I paid for a flight on American. I do appreciate the freebie, but why they chose me and a bunch of other “freeloaders” for this – I have no idea. That I’m not alone, I’ve learned from this Flyertalk thread and multiple blog posts over the weekend. …until the number of invitations exploded on Friday, Jan 12, 2018. Most Flyertalkers who have or are earning the status the hard way are very unhappy and not unreasonably so. I’d be bitching too, if I were in their shoes. Hell, I should be bitching anyway because some folks out there got an offer for Platinum Pro, not just for lowly Platinum like me. Grrrrrrrrrrrrrrrrrrrrrrr. Then again, some folks only got Gold. Get free American Airlines Gold, Platinum, and Platinum Pro status from now until May 25, 2018. This offer doesn’t use the word “challenge,” but that’s exactly what it is. To extend your elite benefits through January 31, 2019, earn 12,500 Elite Qualifying Miles (EQMs) and $2,000 Elite Qualifying Dollars (EQDs) on American or other eligible airlines for travel between the date you register and May 25, 2018. Here are the benefits you get as an American Airlines AAdvantage Platinum Status Elite Member. PLUS, as I’ve said before, you will get 20 500-mile upgrades. I had an airline status once: Delta Gold Medallion many, many years ago. There was also a challenge, but an easy one. I don’t remember the details, but, I believe, they gave me Silver first, and then one international flight would bring me up to Gold Medallion. The idea of mileage run has never appealed to me, but I wanted to go someplace anyway, so I flew to Cancun. And got upgraded on the way back, IIRC. And then… here’s the thing, I never used it again. Not once! I rarely fly on business, and I never found Delta to be competitive for those few revenue flights I needed. So the whole value of elite status was completely lost on me. No wonder real frequent flyers get pissed when airlines come out with this kind of creative marketing. I’d be too. It took about 2 hours for my account to reflect my new Platinum status and a few hours for getting 20 free upgrades. So, am I going to try and get the AA status extended? Probably not. For someone who mostly flies on miles, it’s just a bad investment. And besides, the bulk of my travel is slated for summer and fall. I will admit, if I have planned a few flights before May 25, I’d be more tempted. Is American Airlines AAdvantage Platinum Elite status worth it for the right kind of traveler? Oh, yes! It’s not what it used to be, but if you have more than a few flights lined up that can be served by American Airlines, you would be foolish not to try and complete the challenge by May 25th, (even throw in one or 2 mileage runs if you have to). But while the benefits you’re getting are solid, do not expect anything earth-shattering. For example, free 500-mile upgrades are nice (when you can get them), but let’s be honest: we’re talking an hour, hour-and-a-half flight. I honestly can tough it out in coach, and even in the dreaded middle seat. To get a really sensible upgrade above a 500-mile flight you need Platinum Pro – congrats to those of you who have netted that bounty. And let’s not forget that these upgrades are only valid for revenue flights. In order to get a shot at the upgrade on an award ticket (something that I personally would greatly appreciate) you need at least Executive Platinum status. As far as I know, no one has gotten that for free. In addition, these upgrades are only valid in the U.S., Canada, Mexico, the Bahamas, the Caribbean, Bermuda, and Central America. If you’re flying to other parts of the world, you’ll need Systemwide Upgrades available only to Executive Platinum and Concierge Key members. And if you think this status gives you extended award availability, then no. It doesn’t. That’s right, only Executive Platinum and Concierge Key will scratch that itch. On the other hand, free access to MCE (Main Seat Extra) even on award travel is damn good! Brings you back to the old and more civilized era of air transportation. 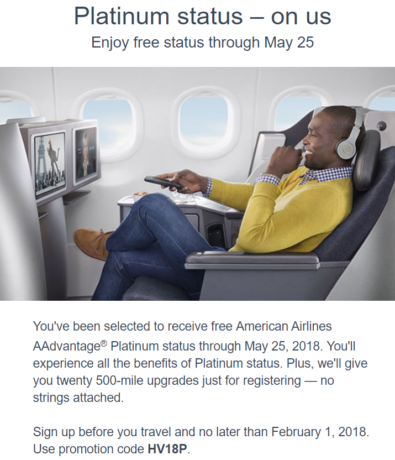 A lot of people have received invitations for free AAdvantage Platinum status (also Free and Platinum Pro) with a relatively easy challenge to complete by May 25. You get free status (either Gold, Platinum, or Platinum Pro) right away. There doesn’t seem to be any rhyme or reason for targeting people except that they don’t do a lot of revenue flights on American. Did you receive an elite Aadvantage status offer and, if so, which one? 5 Responses to Did You Receive Free American AAdvantage Platinum Status? MY AA Platinum status is expiring on 1/31. I got an offer to extend status for one year – Gold for $699 or Platinum for $1299. I have 50 upgrades banked, which I won’t be able to use if I let my status expire. I suppose it’s cheaper than spending $3000 EQDs, but still seems expensive for what you get. Seems like a decent, albeit expensive offer. I probably wouldn’t go for it, (but would be tempted), but fly revenue often enough, and it’s easy to justify the expense. Has it really been improving, as AA and their paid blogger shills have been claiming? Improving — I wouldn’t go that far, but I wouldn’t call them useless. I can find a good value for them, but I’m usually very flexible and mostly fly solo. I can see how you might have an issue cashing out for a family of 4. One thing I do like about the Platinum is that you can get Main Extra seats even on an award ticket. Upgrades don’t seem like anything worth chasing for me. Even if readers didn’t get an email form AA for the promo – can you provide the code so they can possibly go to AA & try to get the status?